Though it is not known officially whether the feathers are flying at VW over the new I.D. family of cars, one can infer it by looking at the statements of Hinrich Woebcken, chief of VW of America, and someone at Wolfsburg who made a statement contrary to the U.S. chief. The fur is flying at Volkswagen as they try to figure out where to build at least two of the three new I.D. electric vehicle family. Honestly, the stance of the American branch of the German automaker makes much more sense. Let’s face it, VW has never figured out how to market here. Sure, its marketing types think they know how to sell to the American market. However, the only thing they have proven in the last five years is that, except for some specialized models like the Golf GTI, they don’t know how to make things work here. If they did, then they wouldn’t have had to reinvent the Tiguan, turning the line into the two models: 1. A longer-bodied version, Tiguan 2018, and the standard Tiguan XL, to move things along. Before the Tiguan 2018 introduction – it is longer, somewhat lower and broader than the Tiguan XL, the version handled by Wolfsburg and certainly different than the Tiguan XL (the German-built compact is primarily front-drive, as well). For buyers looking for an intermediate SUV, which one do you think they would choose, the longer Tiguan, a real intermediate that also offers all-wheel-drive, or the smaller, primarily front-drive import. If I were a betting person, I would put my money on the U.S.-derived, extended vehicle. I would also put that up as the stronger seller in the U.S. market, and I would say that dealers probably would discount the shorter version actively so that, though it might look like a reliable seller, it was only driven by discounting. As soon as the discounting stops, 2018 Tiguan, also called the “Long Tiguan,” would decisively take its already good sales figures and move toward better numbers. 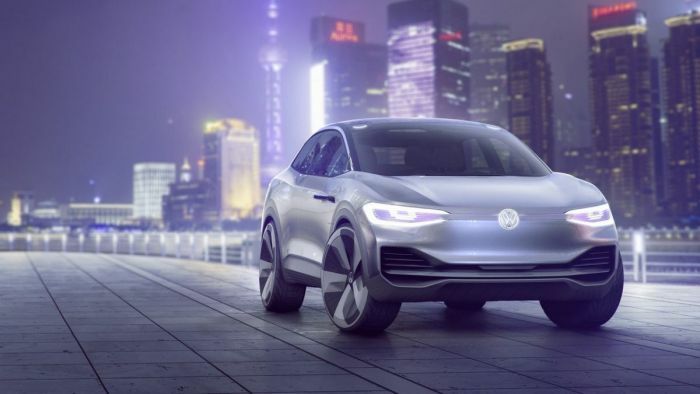 Woebcken Believes Two of Three Should be Made in U.S.
Hinrich Woebcken, VW’s North American CEO, told Autocar, he supports building at least two of first three vehicles here. In an interview with Autocar, Woebcken defiantly made that statement. The models under discussion are the I.D.Crozz, a crossover, and the I.D. Buzz, a revival of the iconic MicroBus of the 1960s, both in electric form. I.D. Crozz Concept Unveiled at Shanghai. A VW spokesman, speaking to Left Lane News, scotched Woebcken’s statement, He said that “we want to build MEB cars locally, but we have not confirmed which cars or the location?” It’s entirely possible that Woebcken and the people who have marketed the Atlas, SUV, and Tiguan, three-row utility successfully, have surprised VW Germany with the success of their new vehicles. Still, Wolfsburg believes it should handle all car sales and marketing chores. Further, the Trump tariff train may have an impact on the new vehicles. Some automakers – Volvo, for example – have decided to move the production of new models, like the XC60, back to Europe from China where Trump has placed added duties on Chinese imports. Trump has also threatened new levies on vehicles imported to the U.S.
Volkswagen has plans to invest $85 billion in new electrics by 2022. The automaker plans to launch 80 new electric vehicles by 2025. Plans call for it to offer electronic versions of each of its 300 group models by 2030.